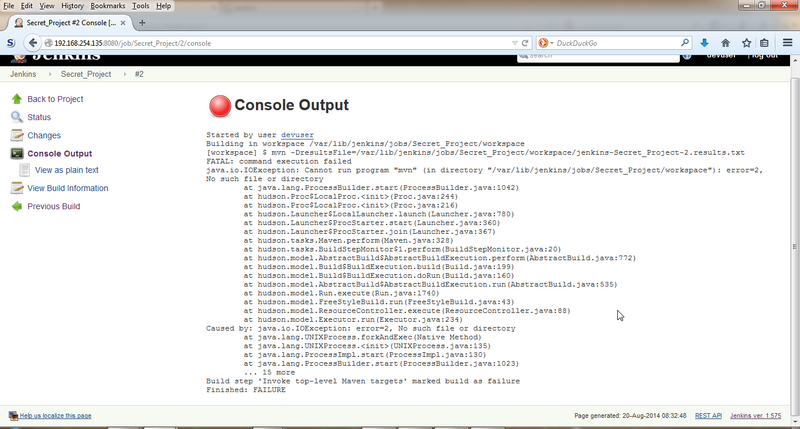 Disclaimer: We would use only existing features of Jenkins, no 'exploits' here. 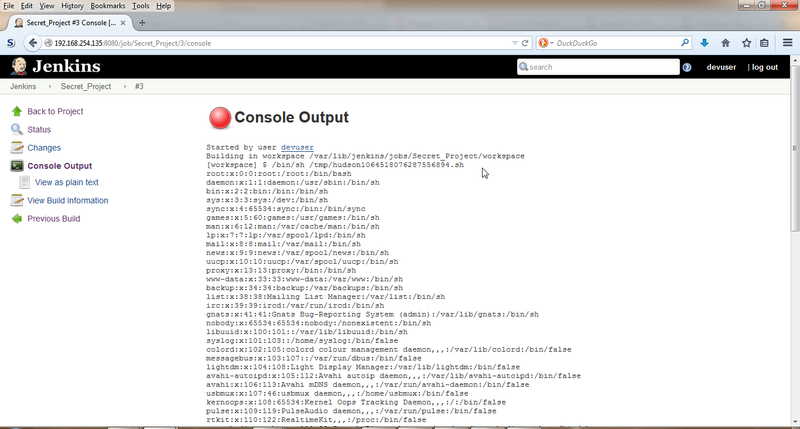 During a recent penetration test I came across a Jenkins server. Having written a blog post on it, I was really excited and jumped straight to the /script url for the Groovy script console. 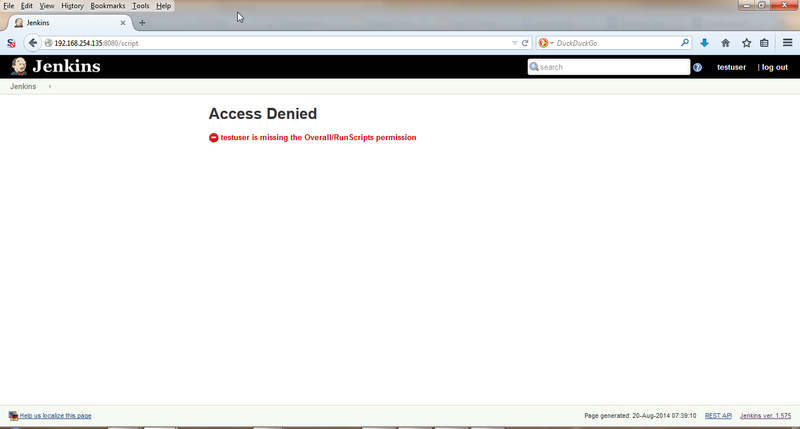 But, it redirected me to a login page. Bummer! It turned out that in Standard Security Setup, a registered user and anonymous user have same privileges unless otherwise configured. During the pen test, I found links to couple of repositories in build details (console outputs) which were a treasure trove. 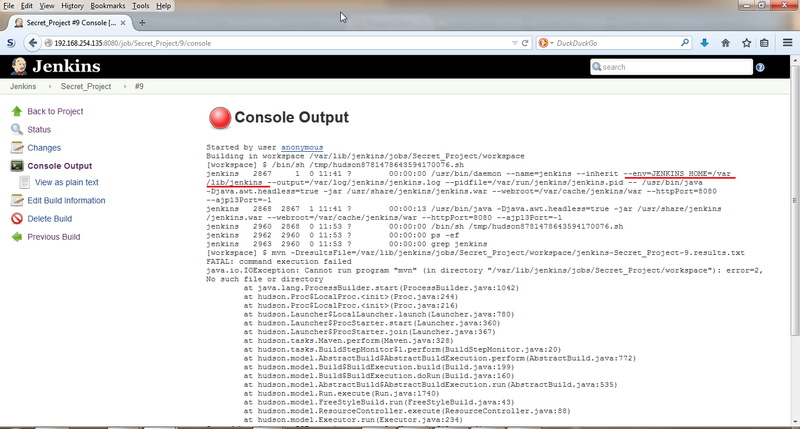 but nothing on the Jenkins server itself. It be noted here that I was unable to see the build details on my test machine which is the latest version. I quickly ran a brute force on all the listed users using Burp and 500 worst passwords list from Skullsecurity. I ran it on POST request to /j_acegi_security_check. If you use Burp intruder, make sure it is configured to follow redirects. 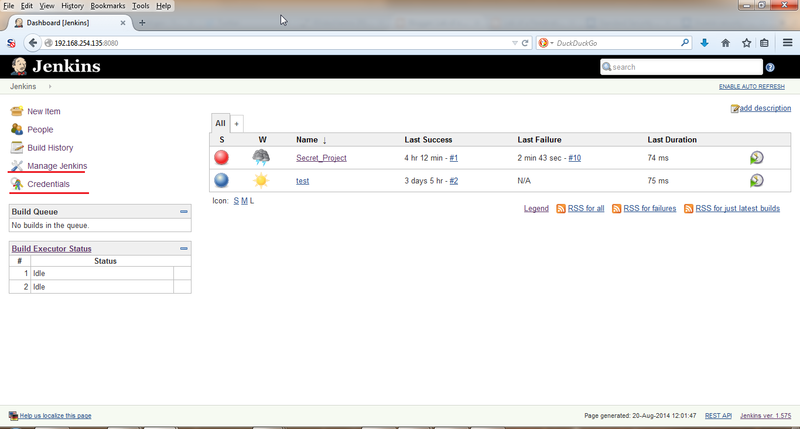 Few minutes later, I got password for two more users but none had access to the script console. Aaargghhh! The script didn't execute. There had to be a way out! I called up my elder brother (he is on twitter, follow him!) who is a veteran in configuration and build management. He suggested me to see if there is any task running before the "Execute Shell" build step and is failing. There was one indeed. He further suggested if I could re-order the build steps. 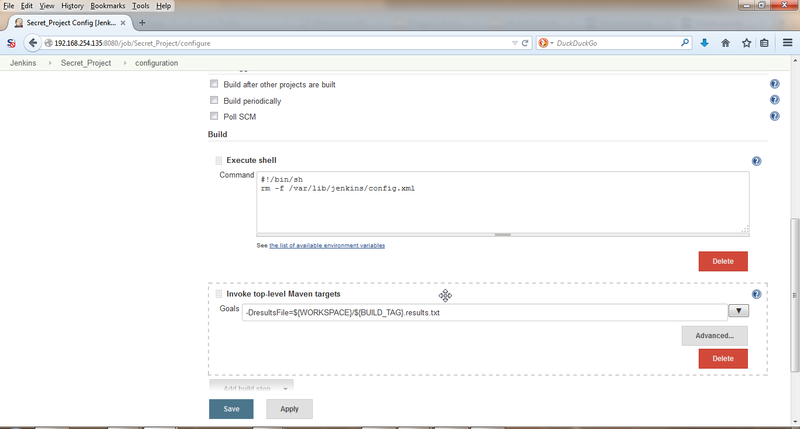 Quick duck search returned a way, I just need to drag my Build Step to top, save and build. Aaand, finally! Now, you can try getting a meterpreter session using built-in perl, python, ruby etc. And if it is a windows machine use powershell for various attacks as mentioned in my earlier post. 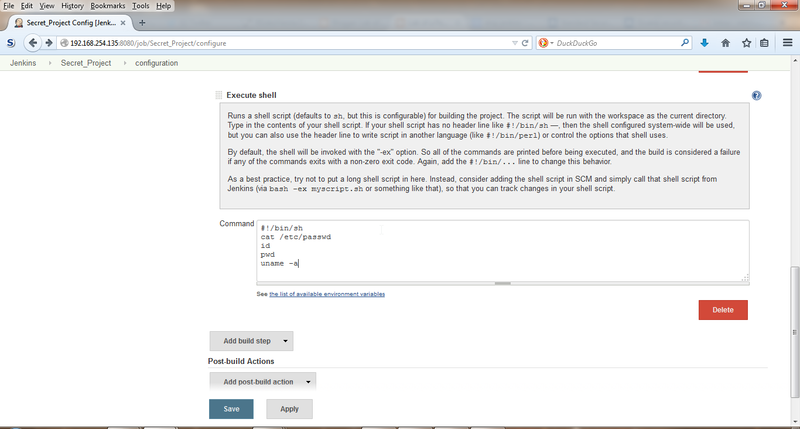 Note that unlike script console we need not use Groovy script if we use the build step. If you want to get admin access to Jenkins, read on. 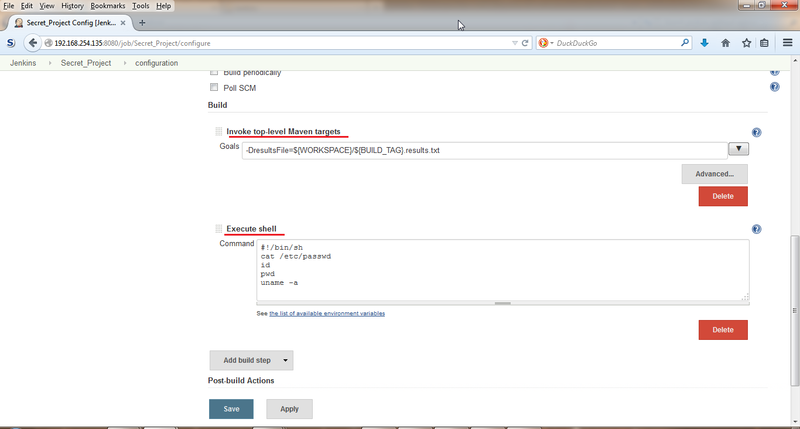 As per, Jenkins documentation here, you can disable security by setting the [useSecurity]true[/useSecurity] to false in config.xml in $JENKINS_HOME or by deleting the config,xml. Lets check for $JENKINS_HOME, we use "ps -ef | grep jenkins" in the Shell Execute step. UPDATE: You must have sudo privileges to be able to restart Jenkins. My test machine had a bad configuration. But if Jenkins is running on a Windows machine, you can restart the service as it runs with SYSTEM privileges (or at least Admin privileges) on Windows. Note that, you may need to move to a reverse shell or meterpreter before you can restart Jenkins service on Windows. Save, build and refresh. Bingo! Admin access for everyone! UPDATE: Deleting config.xml is absolutely not required. You could always run a sed command to replace [useSecurity]true[/useSecurity] with [useSecurity]false[/useSecurity] for same results (service restart required). Hope this would be useful. Please leave comments. A secure Jenkins master should have no executors configured on the master, only slaves, which would prevent this class of trivial attack. Thanks for the comment Jesse. The attack being so trivial makes it more lethal. I see that you are a developer at CloudBees so I would like to suggest some improvements in addition to what you suugested. A secure Jenkins master should also not list users to everyone, should enforce use of captcha after failed password attempts and Jenkins user on master should not have permission to modify config.xml. 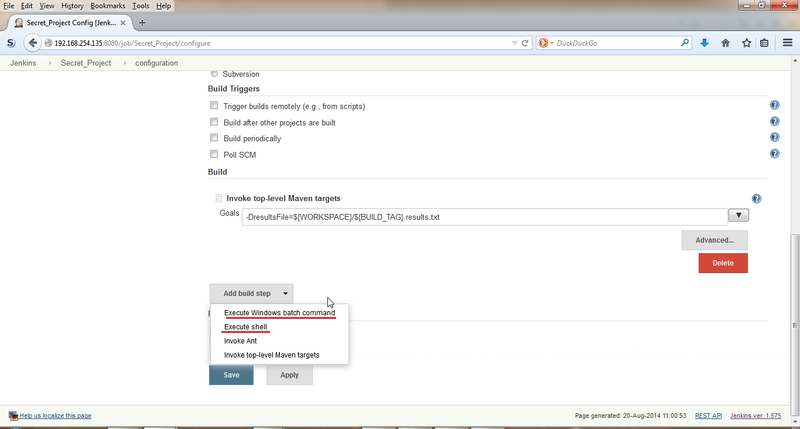 Also, Jenkins should gradually do away with the ability to run builds on master. I don't think Jenkins by design allows you to disable listing of usernames, does it ? Thanks. Haven't looked at all options but at least in the security settings recommended by Jenkins, it doesn't allow to disable listing of usernames.